Covering 6,641 square kilometers (2,564 square miles), Banff National Park lies on the eastern slope of the Rocky Mountains in Alberta, Canada. Banff was the first national park declared in Canada, and the third national park in the world. The park’s origin lies in an accidental discovery of a cave containing hot springs in 1883. The park began as a 26-square-kilometer hot springs preserve. 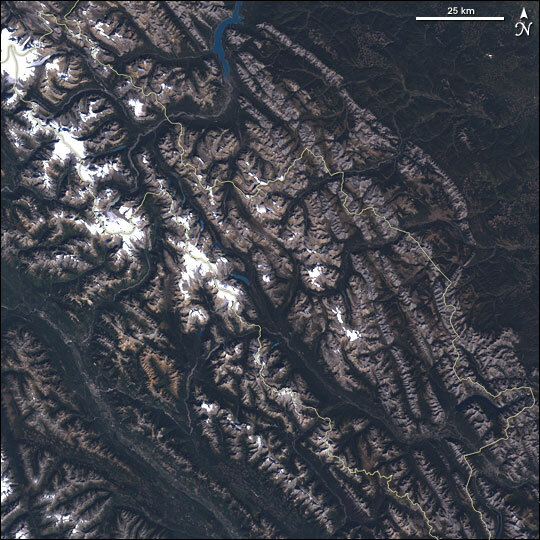 The Enhanced Thematic Mapper Plus (ETM+) instrument on NASA’s Landsat satellite captured this true-color image of Banff National Park on September 14 and September 23, 2001. 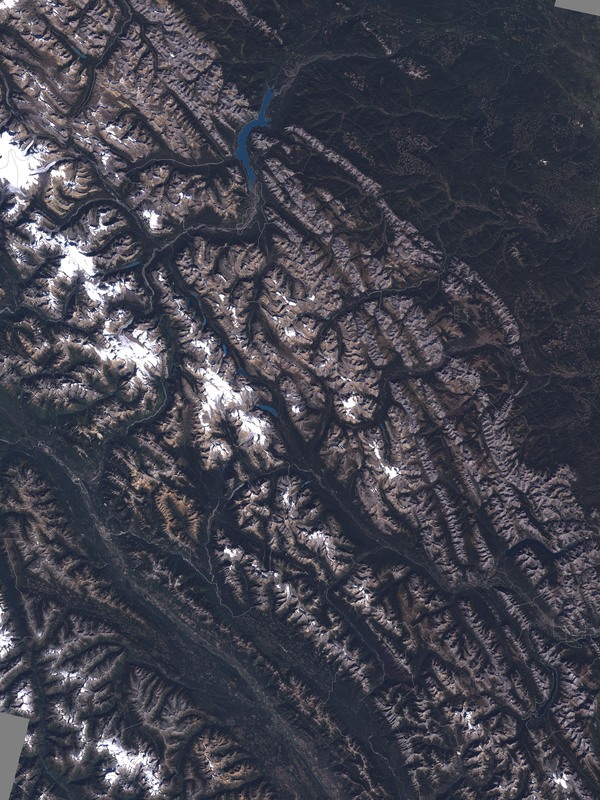 In this image, bodies of water appear royal blue, snow-capped peaks appear white, and the land appears in varying shades of brown. 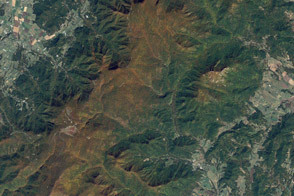 The park’s contours are outlined in pale beige. Banff’s mountainous terrain includes glaciers, valleys, rivers, and meadows. Parks like Banff that span a wide range of altitudes have a treeline, below which trees flourish and above which few trees can grow. Vegetation in the park ranges from conifer and aspen trees below the treeline to alpine shrubs and even bare rock above the treeline. Besides fish in its waterways, Banff’s wild inhabitants include black bears, grizzlies, wolves, moose, mountain caribou, hoary marmots, pikas, ground squirrels, eagles, and harlequin ducks. NASA image created by Jesse Allen, Earth Observatory, using data provided courtesy of the University of Maryland’s Global Land Cover Facility.